I have wonderful childhood memories of smelling corned beef hash in the morning. Match it with a bowl of rice and you're in for a perfect breakfast to ready you for school afterwards! My mom often sauteed corned beef with onions and potatoes to make it more delicious and filling. Today, I'm sharing two sets of easy-to-prepare recipes. 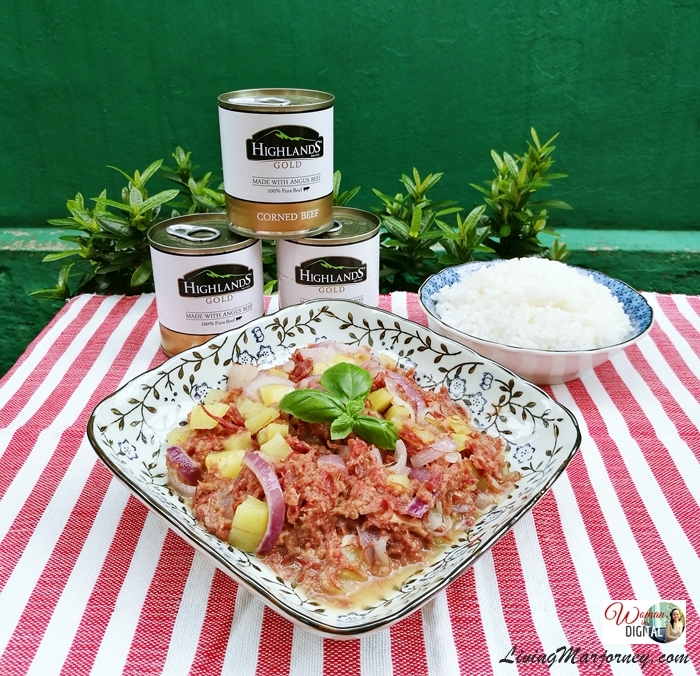 Reviving my mom's traditional corned beef hash recipe with a twist by using a new premium corned product called Highlands Gold Corned Beef - this will be my first time to whip-up a recipe with this brand. Before, I was using another brand which has been in supermarket for decades and I thought it was the best corned beef until I discover Highlands Gold Corned Beef. 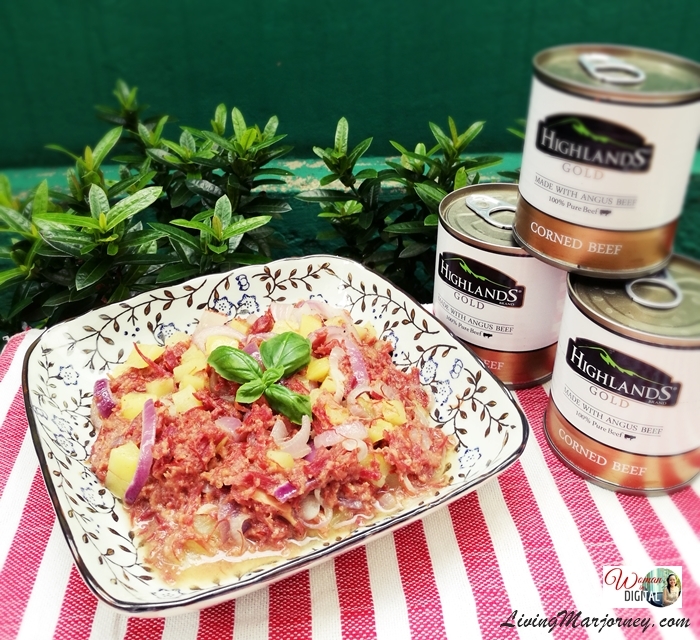 Compared to other leading brands, Highlands Gold Corned Beef is made of 100% pure beef. The first recipe features an easy-to-cook yet surprisingly tasty, filling breakfast that reminds me of my childhood years. I hope you will feel the same. 5. Served with rice or baked beans. For the second recipe, I am inspired to create a light and healthier meal for my husband who usually skips rice for dinner. I know a lot of people who don't eat rice to lose weight. Sadly, they miss what we call a 'balance diet' which can drastically lower their energy levels and make them weaker. With Angus beef, you can have the recommended amount or protein in your diet. I like to serve Highlands Gold Angus Beef Corned beef in a warm bagel with lettuce, tomato, arugula salad. It's going to be a delicious meal you can have anytime of the day especially created for the health conscious. The idea here is to take corned beef - a common ingredient - and put a twist to it by creating a salad with refreshing ingredients. 1 small tomato or cherry tomatoes (optional). You can also use cucumber. 1. I like sauteing corned beef in onion. It adds more flavor to the corned beef. But you may opt to just warm Highland Gold Corned beef in the microwave. 2. Warm bagels in the toaster or oven. You may also use your favorite bread like wheat or white bread. You may also use focaccia. 3. Place lettuce, tomatoes, arugula. Add Highlands Gold Corned Beef. 4. Add cheese on top. 5. Warm in the oven or oven toaster before serving. 6. Drizzle with honey, here I'm using a special salad dressing I got during my trip to Aloma farm. It's sweet has sesame seed too! Highlands Corned Beef has no artificial flavors, so you can expect the natural taste and tenderness of real Angus Beef. It has longer and juicier beef strands too! It is available in 100g, 150g, 180g, 210g and 260 grams can sizes. I hope you will enjoy these two easy-to-prepare all-day breakfast recipes with Highlands Gold Corned Beef. Try it at home and let me know what you think. I do love a good breakfast, any time of the day! thanks for sharing your recipe!! OMGoodness, those two dishes look delicious. I have fond memories of my father and I sneaking out and going to the diner a couple miles away and having corn beef hash, homefries and eggs for breakfast. Now I think all those carbs. I allow myself cheat days and will have to try your recipe! That does sound like a fantastic way to start the day. I like something hearty in the morning to give me the energy I need to conquer my to-do list. I do not eat foods with artificial flavors. I like that this Cornish Beef does not contain any. I can't remember the last time I ate corned beef but I loved it as a kid. Have to buy some asap and try out your recipes!